Years ago, I went to visit Costa Rica. I had wanted to go white water rafting. I told my old college roomate about my plan and she said, “My mom lives there and has a house there. Can I go, too?” I said yes to that. I had no idea her mother, Carol, had moved there and that Kate went to Costa Rica regularly. Carol’s house was much nicer than I had imagined. I thought we could stay in the mountains for a few days before going to another part of the country, where the river ran. I had wanted to get to water, and thought there would be none up where we were staying. Someone forgot to tell me about the pool overlooking a vista with five distant, yet visible volcanoes. This spot was the bomb. Carol wanted to take us to one of the nearby towns, which was famous for its tourist crafts, as a nice way to put money into the local economy. We drove through other towns to this place that was like a wooden mall, full of souvenirs. To be honest, I found most of it to be pointless and ugly. I'm not trying to be mean. I know someone had to make all of it, but I was not really attracted to almost any of it. I bought a small tin cup with a painting of a building on it. There, I bought something. As the other two browsed, I started to hang around by the front door, a sure sign that I am “done” with a place. While I was hanging around out front, I noticed a man a little down the road with some paintings propped up on makeshift easels. They had wanted to head back, but I asked my companions for a few minutes to go check out what he was up to. They let me investigate and came to look too. We walked down the road. A small studio was perched on the side of the road, with the jungle slanting back and down, behind. In my crappy Spanish, I was able to praise the man, Ulises (like Ulysses), for his work, which was very strong and simultaneously sophisticated and primitive. I bought one of his paintings! In the studio, there was a tray of burnt looking clay figures and fragments. I picked up a feline looking head, a Jaguar head. I asked if that was his sculpture and began to praise the heck out of it. 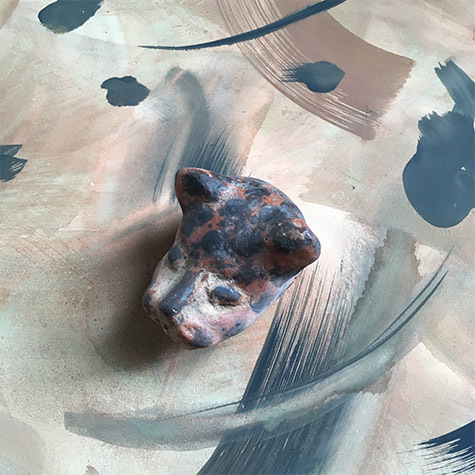 He said no, that it was an artifact he found in the jungle that stretched out back. That's my messing around with painting under the artifact, not Ulises. I had been going on and on about how cool it was that he had found it, wondering how old it was, who made it, and everything like that. He was so grateful that I had bought a painting, a REAL painting, instead of the tourist crap next door - that he insisted that I take the artifact. He would not take no for an answer. It was, and is, a fabulous gift. Since then, I move it around my house. Often, it lives on my bedside table, where it usually looks good with whatever else is going on there. I really like it. It inspires me in a way. I painted a surface about it. 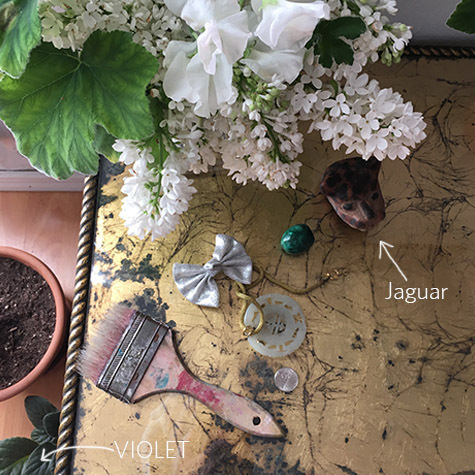 I used a permutation of said surface in a photoshoot for Claflin, Thayer & Co.
As my violet began to bloom, next to the artifact, I got a lot of enjoyment from just glancing at those two things. The elements began to combine in my mind. When last in New York, I went to the Met. I had taken a photo of an ancient painting of tiger skin rug. I liked how they stylized the spots. I spent a long time drawing the violets and the shapes of the spots for this design. The final design may be view in the password protected gallery. Request the password using email via the contact page.